I’m the cartoonist who usually doesn’t like positive cartoons but sometimes greatness needs to be acknowledged and commemorated. 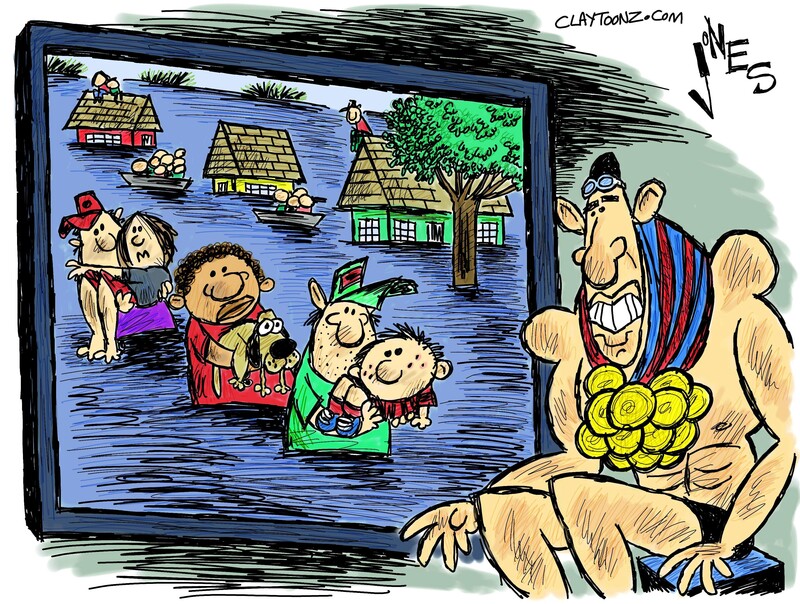 I was thinking how Phelps and other Olympians win medals for what they do in water, while many in Louisiana are literally under water. Many who have lost their homes are too busy saving others to count their own losses. Those are heroes. I’m not taking anything away from those who compete and represent their nation in an athletic contest, but the real gold winners are in Louisiana this week. Louisiana is my home state. I think of it often and more so this week. I miss the scenery, the bayous, po boys, gumbo, etouffee, crawfish, the spices, and even though most of the people there would disagree with me politically, I miss them too. This week they exhibited why they’re some of the greatest people in the United States. And yes, they do make the best food in the world.